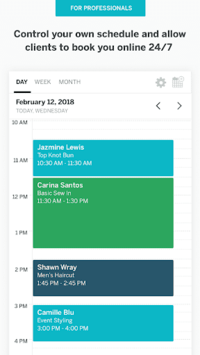 Salon appointment booking and scheduling software for beauty pros and barbers. 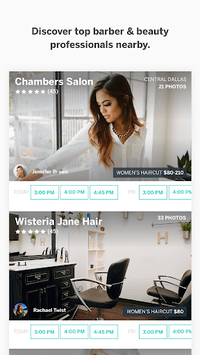 With over 100 million appointments booked, StyleSeat offers powerful business tools for beauty and barber professionals and it gives clients an easy way to discover and book services like haircuts and makeup online. Clients can easily discover and book beauty & barber appointments online. Weather they’re looking for pedicures, lash extensions, weaves, or new hairstyles, StyleSeat offers a convenient way to browse photos and reviews, get important pricing information, and book appointments at time that works for them straight from their professional's calendar. - Browse photos of hairstyles and color and find a salon that’s right for you. 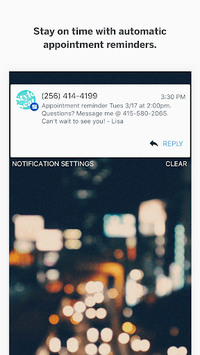 - Never miss a massage with helpful appointment reminders. - Book recurring appointments with your barber so your haircuts are always on schedule. - Realize you need to get your nails or makeup done for a wedding but it’s too late to call your pro? Hop on StyleSeat, find their next opening, and book a manicure. - Tired of the same hairstyles and nails? Browse the directory and find a stylist that’s a better match. On average, stylists waste more than ten hours a week on various tasks. Imagine how many appointments you could fill with those extra ten hours! StyleSeat does the busy work for you so you can focus on delivering great services and getting paid. - Your service menu is online. Clients can look through your services, read the descriptions, and get pricing information so you can stop wasting time answering inquiries. - Clients book themselves. You won’t have to schedule a single appointment — no phone calls, texts, or DMs. Once you share your schedule online, clients can find a time that works for them, put a credit card on file, and book an appointment. You get a notification once the appointment is booked and all you have to do is show up and work your magic. - You get bookings 24/7 Allowing clients to book and reschedule 24/7 means you never miss out on the opportunity for a booking — no more phone tag, no more full inboxes. - You can easily accept credit cards. Clients put a credit card on file so check out is quick and painless. All they have to do is tip and sign. - You get detailed reports. See a breakdown of your daily/monthly/yearly sales, deposits, and transactions — no need to manually keep track. - You can build client relationships and encourage more bookings. Send custom email marketing campaigns, run promotions, and customize each appointment with detailed client notes and booking history. - You get paid when clients don’t show up. The average stylist faces 1-2 no-shows a week. For some, that can add up to nearly $5,000 a year. Set up a no-show late cancellation policy and clients will be required to enter a credit card when they book. You choose how strict your policy is and when clients don’t show up, you get paid for your time. - You can block clients. With the client notes tool, you can track how often clients no-show or show up late. If a client is chronically late, you can block them from booking with you.